Tourists take photos on the Yalu River Broken Bridge, with the Sino-Korean Friendship Bridge behind, in the border city of Dandong, in China’s northeast Liaoning province on February 23. 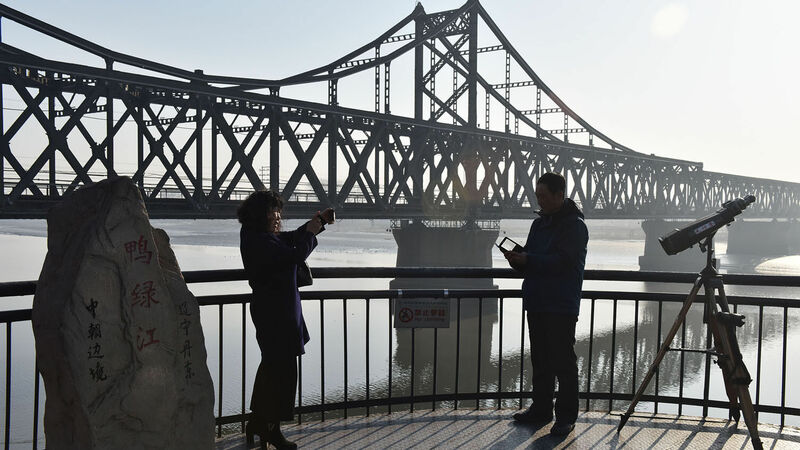 China and North Korea on April 8 opened a bridge across the Yalu River, signaling a stronger desire between the neighbors to deepen bilateral trade despite international sanctions imposed on North Korea. The new bridge connects the northeastern Chinese city of Jian with North Korea’s northern border city of Manpo. The Jian-Manpo bridge is built mainly for passenger and cargo transport. The passageway will feature an advanced customs facility equipped with 5G technology. China and North Korea agreed to the massive project in 2012. The construction was completed in 2016, but opening of the bridge was delayed due to international sanctions on North Korea. Another construction of an expressway linking Jian with Tonghua, an industrial city in the northern Chinese province of Jilin, is underway. When finished, it will improve the flow of goods from Manpo city in North Korea to the Chinese border city of Jian and Tonghua, another sign that the two nations are willing to boost bilateral trade amid international sanctions. The Bible’s prophecies show that, in a sense, the North Korea crisis is a massive distraction from the real threat posed by China and Russia. These powerful Asian nations are the only reason North Korea is able to operate so freely. And Bible prophecy shows that they pose a threat many times greater than the one from North Korea! Nevertheless, nuclear technology from North Korea could still play a major role in events during the time ahead. The specific Bible prophecies that Mr. Flurry’s analysis is predicated upon are found in Ezekiel 38 and 39, Daniel 11 and Revelation. These scriptures show that a powerful bloc of Asian nations, led primarily by Russia and secondarily by China, will form and play a pivotal role in the Great Tribulation, an end-time period of unparalleled war and suffering. These passages also show that smaller Asian nations, such as North Korea, will be integrated into this Russian-led bloc. With the opening of a new bridge between China and North Korea, we can expect North Korea to deepen its economic ties with China to keep its economy afloat and possibly join the Russian-led bloc. To understand more details about the prophecies that Mr. Flurry’s analysis is based on, please request our free booklet Russia and China in Prophecy.